Just like the famed World Cup stickers from the card maker, 2016 Panini NFL Stickers Collection is mainly about the fun of collecting and the thrill of completing the set via opening packs and trading duplicates. While it does not contain the premium hits that many have come to expect from modern sets, the lengthy checklist offers ample coverage of the National Football League. With only a base set, the simple release totals 485 stickers. Among these are 131 foil subset stickers that feature a shiny finish. In addition, 2016 Panini NFL Stickers Collection offers a focus on Super Bowl 50 with highlights of the key moments from the Denver Broncos' win over the Carolina Panthers. Other Super Bowl-winning teams are also honored. The deep 2016 Panini NFL Stickers Collection checklist features at least a dozen stickers for each team and includes the top names from the 2016 NFL Draft. 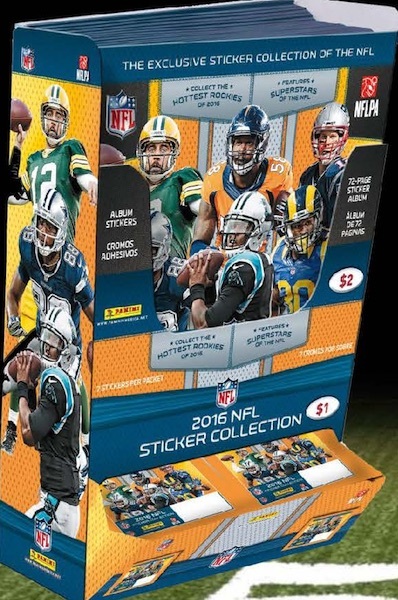 Collectors can store their 2016 Panini NFL Stickers Collection set in the official album that is sold separately and retails for $2. With 72 pages, there is room for every sticker and each team has a two-page section in the album. The seven-card packs go for $1. 80 ILLUSTRATION - Steve Smith Sr.
257 ILLUSTRATION - Odell Beckham Jr.
374 STAR - Ted Ginn Jr.